The Ergotron 45-353-026 versatile arm can be used in many different ways - install a small monitor for use within a sit-stand workstation or add a large display up to 25 lbs for digital signage. With a 33" extension, 20" vertical adjustment and 62" side-to-side motion, this arm allows a wide range of mobility to the monitor. This LX Arm has a 20-inch (51 cm) height adjustment allowing you to alternate between sitting and standing positions. Question: Will this arm hold TV that is 42" in screen size and weighs about 28 lbs? The model of my TV is LG 42ls5700. Answer: No, your TV is not compatible with this arm as the weight of your TV is more than the weight that this arm can hold (25 lbs). We recommend the Interactive Arm, which extends 24" and can be fully retracted to 5.5" when not in use. Question: What does the wall track option do? Answer: The purpose of the wall track is to strengthen the installation of the arm by distributing the weight over a larger surface and also provide more vertical adjustability as the arm moves along the track when installed. I mounted two 19" monitors on this arm using the adapter kit, and the arm holds them in position without any drift. It is great having a separate arm for the keyboard so the vibration from typing does not make the screens wiggle. I'm a fan. I have used a LX Sit-Stand Arm for three-years with a 27" monitor. 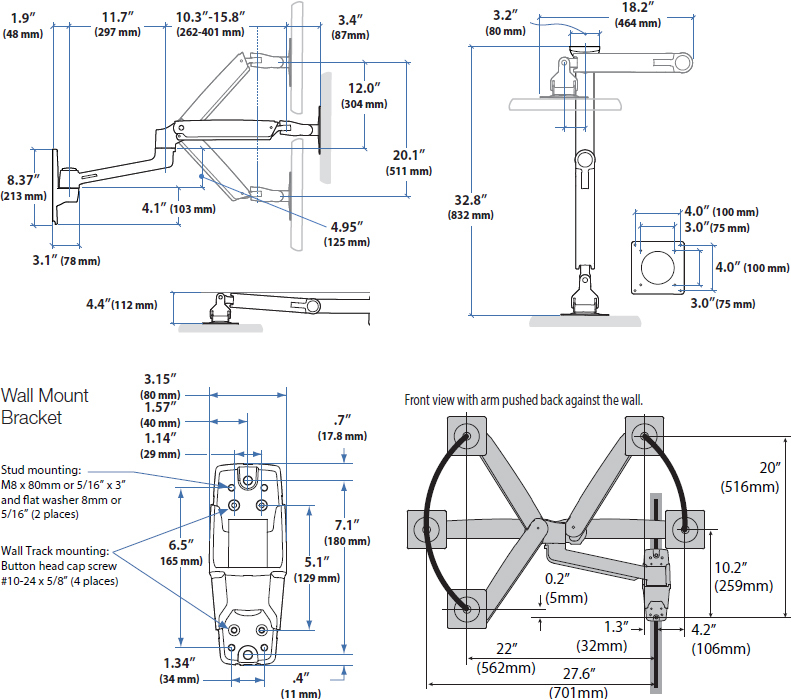 I purchased another LX Sit-Stand arm for a second 27" monitor on my desk because I had been so pleased with Ergotron's design and build quality of the first unit. The arm is easy to install and adjust. Being able to move both monitors up, down, left, right, and change orientation independent of each other is fantastic. Ordering from Ergodirect was smooth and the item arrived quickly. We bought this to hold a TV in our kitchen cabinet over our refrigerator. It works perfectly to hold a 32" screen and compared to other cabinet TV mounts, is smooth to move in and out, stable, and an elegant solution. This arm works great for our 40 inch tv to let it be moved into an area when we're watching tv and moved out when we're entertaining friends.